Internet has become more and more popular in last two decades. Now most of the businesses either already have their online presence through a website or they are planning to get one soon. Now the number of people who use internet for many of their day today activities like shopping, banking, learning, social networking, chatting etc are skyrocketing with each new day. But these modern, tech-savvy and knowledgeable people like to visit a website which is attractive, easy to use and professional. They don’t like to hang around traditional HTML websites which are not visually appealing. Also, the successful management, optimization, customization of the static HTML site ask for lots of resources, time, manpower and money. Hence most of the website’s owners are now preferring to convert their static HTML website into WordPress one. 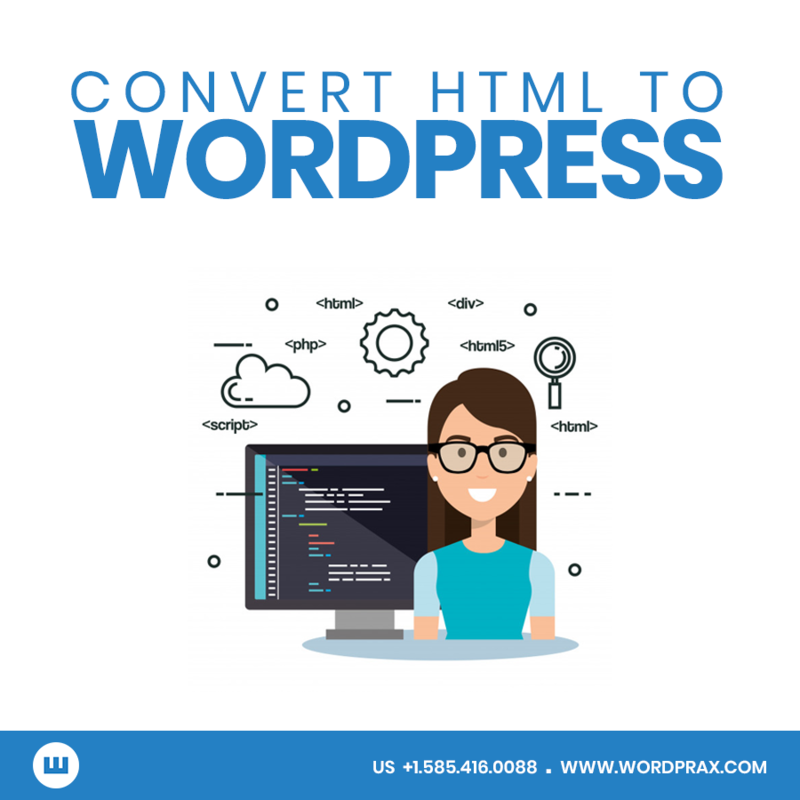 If you also have a static HTML website for your business and now want to Convert HTML to WordPress then go though this helpful guide as we are explaining here the process to convert your HTML site into WordPress site in most easy way without any issue. Before starting the process of HTML to WordPress conversion, you should do thorough research and plan ahead about the future working of your website. A carefully created plan to develop the site in a proper and systematic manner is essential as it will help the owner of the site to get the desired website without any bug or issue. Hence make a document having plan of your future website in advance and decide how you will do different website development works like type of the future site, headings and punchlines, website layout and design, old content and required new content, programming and the need for website migration to a new hosting service, testing and quality assurance etc. There are many free and premium WordPress themes available in the market over internet especially on WordPress repository. You should select some of them, analyze them and choose the best theme for your future WordPress site as per your requirements of business. If you have expert knowledge of PHP programming language then even you can create a fresh theme based on your website or you can customize the existing one to meet your needs. You can also use a child theme for this purpose. If you don’t have much of the technical knowledge then it is much better to hire experts to do this job for you. In order to install WordPress, you have to select a hosting plan. Review different web hosting companies and analyze the plans they are offering and select the best one as per your requirements and available finance. After that select WordPress on your hosting server. Then log into the cPanel of your hosting account and install the WordPress. Just follow the instructions to complete the installation process. Theme Name: Replace with your Theme’s name. After completing this step, just save the changes and close the file. Now create all other files in similar manner. After you finish installing WordPress successfully, hide it from both visitors and search engine bots. This is because they don’t know that your website is in development stage. Hence now first upload the WordPress theme and the required content to your website. Now go ahead and activate it. If you face any difficulty in this process then take the help of WordPress experts. Just remember that all of the site content is stored in the MySQL database. Hence extract it from there and upload it to your site. You can also take help from some WordPress plugins to complete this step easily. You have successfully converted your HTML website to WordPress platform till now. You should review your new site to remove UI/UX issues, navigational problems, performance issues, loading problems, 404 error pages etc. Once you are sure about the quality and performance of your website, launch it for the visitors as well as for the search engines to get maximum benefit out of it. As we have just discussed, in order to keep up pace with the modern technologies and latest happenings in the website world, you have to convert your static HTML website into WordPress one. This will benefit all i.e your business, you, your clients and visitors on the site and your loyal customers. For this you can hire a professional WordPress website development company to finish of your task in more professional manner or just follow the steps given above to complete the process. Category: WordPrax by The WordPrax Editorial.